I grew up hearing the motto “hurry up and wait” often, and we did in fact do a lot of waiting when I was a kid. It was a habit passed down by my grandfather from his days in the Navy to my mother growing up on a small family farm in rural Nebraska. It’s a habit I’ve been grateful for over the years, because it means I’m rarely late and it eliminates a great deal of stress from daily life. My husband’s motto, on the other hand, could be described as “hurry up, we’re late!” That modo di vivere (manner of living) leads to some interesting (I’m being polite, read: scary) drives along the Amalfi Coast roads. I’ve learned that not only do I not appreciate those types of drives, since I get car sick, but that it really bothers me to be late as well. While he admits my habit of getting places early is much better, it’s not so easy to change a habit of a lifetime. With my motorino I’ve been brought back to my natural habits due to its finicky attitude to starting. Turns out that my scooter is really a lot like me in that it doesn’t much care for rainy weather, too much humidity or wind. It kind of just gurgles and says, “No thanks, I think I’d really rather say home today.” But on sunny days it starts right up happily and is ready to go. Hum. I can’t really say I blame it! So that means when I need to be somewhere at a specific time, for safe measure I leave early enough to walk or take the bus as a back up. In other words, I hurry up and wait. Not long ago I had an appointment to get my hair cut in Ravello and it was a humid and sticky morning. Half expecting the motorino to laugh at my attempts to start it, I left with plenty of extra time. 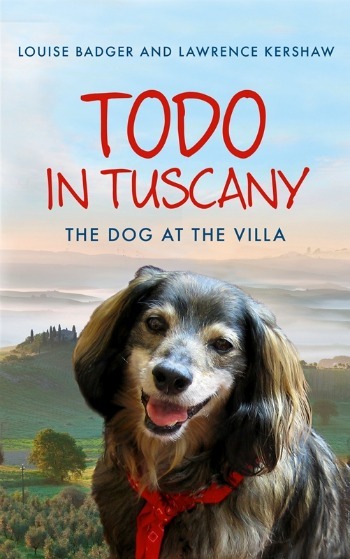 It started right up and I arrived in the piazza in the center of Ravello with all that plenty of time to spare. I could have pulled out a book and found a quiet bench, but I spotted the large main doors of the Duomo open. It had been awhile since I had been in there, so I crossed the piazza and climbed the short flight of stairs. With the doors wide open there was plenty of light to get a good look at the intricate mosaics and detailing on the 12th-century Ambone and the 13th-century Pergamo located on either side of the central aisle down the nave of the church. Both are decorative pulpits that were once used during services at the church, and are now admired for their beautiful mosaic work and carving. 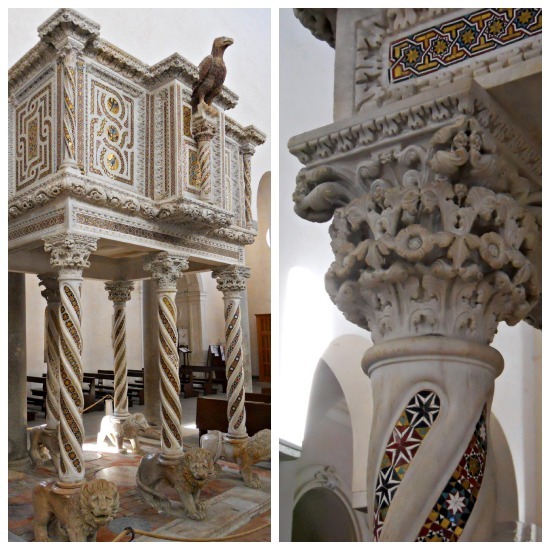 The Pergamo was created in 1272 and is attributed to Niccolò di Bartolomeo da Foggia and features six columns covered with a spiral of mosaics supported on the backs of six marble lions. 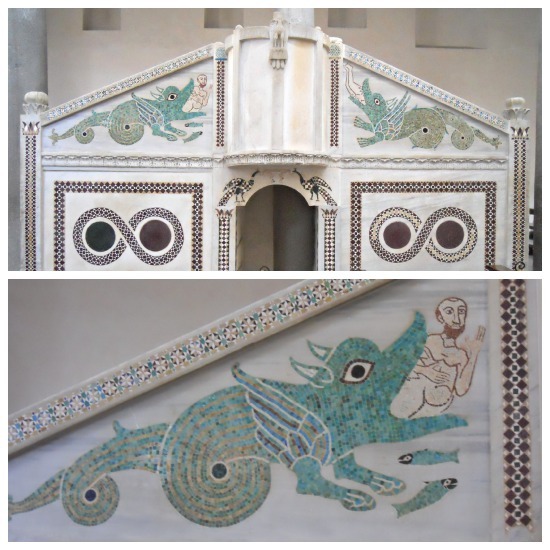 The Ambone in the Duomo of Ravello dates to 1130 and has beautiful mosaics depicting the story of Jonah. The whale doesn’t look quite like we might expect today, but nonetheless I wouldn’t want to be swallowed by it! And then all to soon it was time to hurry off to get to my hair cut appointment. 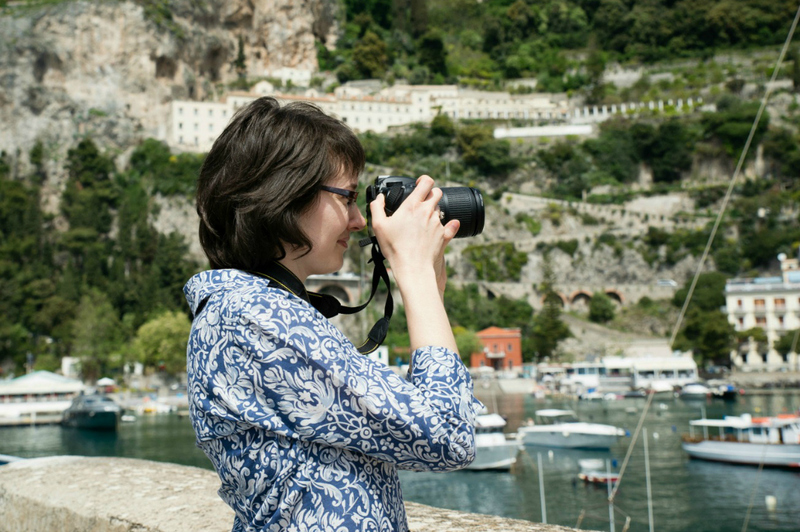 Hurrying up and waiting on the Amalfi Coast can so easily be a pleasurable pastime in itself! Every four years a very special day happens in Amalfi. There are many days to be in Amalfi, but this is the day to be in Amalfi. The distinctive Amalfi blue flags with white crosses are the first sign that something special is about to happen. The city is festooned with the beautiful flags leading up to the Regata delle Antiche Repubbliche Marinare, or the Regatta of the Historic Maritime Republics of Italy, which took place in Amalfi on June 3rd, 2012. 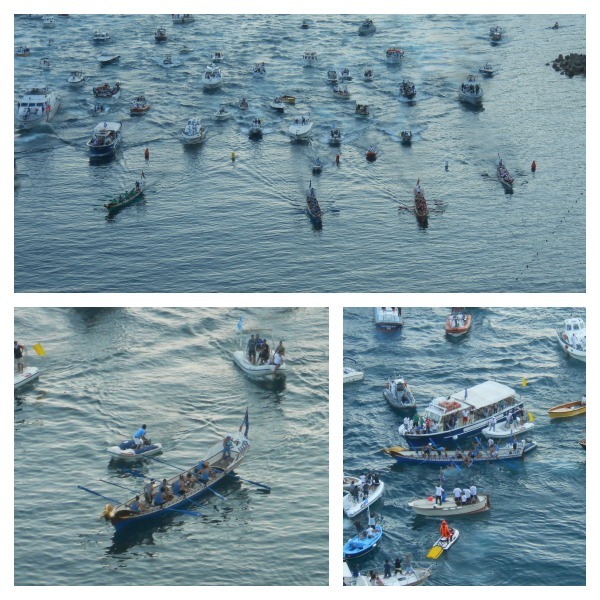 Started in 1956, this annual event brings together Italy’s four historic sea republics of the Middle Ages to compete in a race of 12th-century style boats. Venice, Pisa, Genoa and Amalfi send the best team to hopefully bring home the trophy. The day starts with an impressive historic parade representing a key moment in the history of each city. The costumes are brilliant and many original or based on the original designs from the 50s. 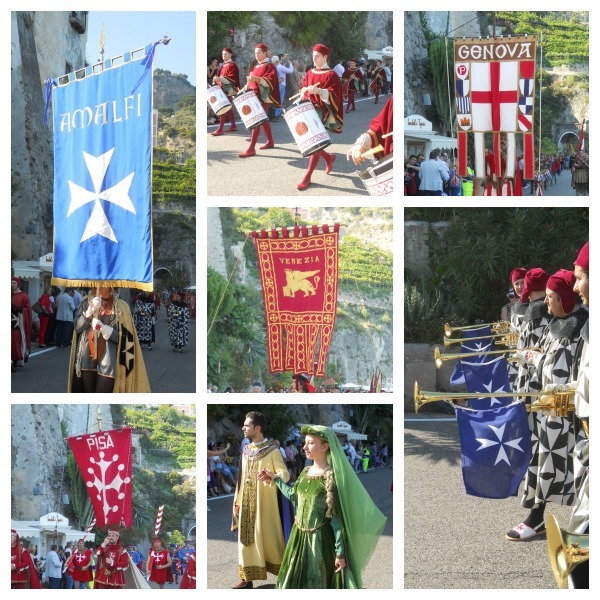 The parade begins in Atrani and follows the road around by the medieval watchtower into Amalfi. I caught the parade right in front of the watchtower where it was a little windy. Nonetheless, the flag throwers put on a great show! After the parade, everyone jostles to find the perfect spot to watch the boat race. All eyes are on the sea as the teams row out to the starting point west of Amalfi. We hurried up the stairs to join friends on the balcony of the Hotel Luna Convento (by the way, gorgeous views!) to watch the race. The streets and piers and balconies all over Amalfi are packed with onlookers ready to cheer on their team. The harbor is full of boats and once the race starts the four teams are followed by a crowd of boats behind. From our vantage point near the finish line, it looked like the Amalfi team got off to a slow start. As the boats came closer to Amalfi and the finish line the Amalfi team was clearly behind, almost in third at one point. Oh, but it takes more than that to bring the Amalfitans down! The energy was amazing with the entire town yelling, “Vai, vai, vai!! !” (Go, go, go!!) And then something that will be talked about for many many many years to come happened. Yes, it was that epic. Watch the last 50 seconds of the Regata in the video below and you can see it with your own eyes. Fifty seconds before the end of the race the Amalfi team was in second or third. (They’re the second boat from the left.) I was even panning over to show Amalfi when I heard someone nearby shout something about them catching up. I turned back to see that they really were! The team came through in the last 20 seconds for an amazing photo finish win! I’d like to think it was the energy of the Amalfitans that helped them do it. 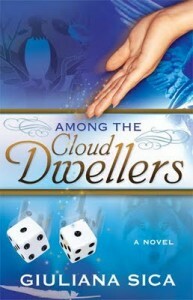 Watch for yourselves! Toward the end you’ll even here me saying over and over again, almost in disbelief, “They can do it!” Then there was silence. Who had won? It didn’t take long for the judges to view the photo finish and announce the winner … and the city erupted in cheers from the land and from the sea when the Amalfi team found out then won. Some of the team jumped into the water and the cheering and horn blowing on the boats was deafening. Some deep and resonating, some like fire sirens wailing, pierced by air horns and car horns and fireworks. Naturally, someone on another boat came prepared with a huge bottle of champagne to shower the team with during the celebrations. Look closely in my video and you’ll spot that below. What an experience! It’s hard to capture the emotions in Amalfi this day, but it was something I’ve never felt before. In 2008, during the last Regata in Amalfi, the Amalfi team came in last. Let me just tell you, the atmosphere was pretty different this year! While they were presenting the trophies, we snuck through the crowds to get a closer look at the four beautiful boats used for the race. Each one features the colors of the four cities, blue for Amalfi, green for Venice, red for Pisa and white for Genoa. 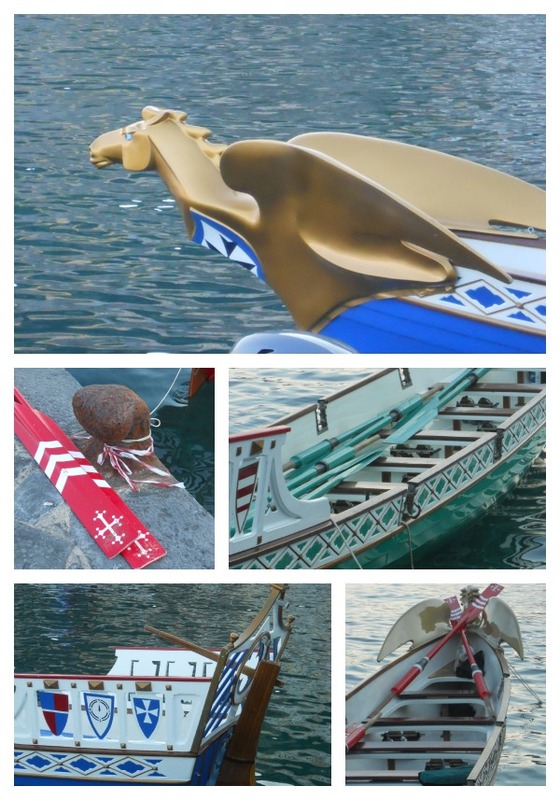 The prow of every boat has a distinctive figure, and Amalfi’s is a pegasus with menacing eyes. Just look there, that’s the nose that the Amalfi team won by! To see all of my photos from this spectacular day, view the slide show below. (Click in the lower right to view it full screen.) Click here to view the photos on Flickr where you can read more comments about each photo. The Regata delle Antiche Repubbliche Marinare rotates between Amalfi, Pisa, Venice and Genoa, and usually takes place the first Sunday in June. Whether you see it in Amalfi or one of the other cities (while root for Amalfi, obviously! ), it’s an amazing experience. I hope you’ll be there cheering in four years when the Regata returns to Amalfi!